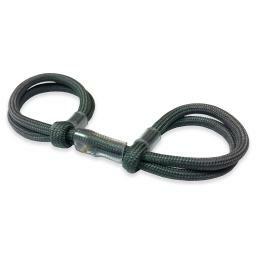 Double Loop Finger Slings for Archers. 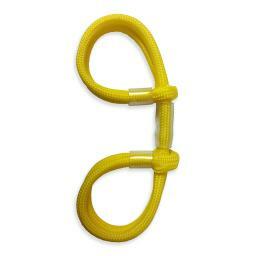 The shape and width of Bowrap Double Loop Finger Slings offer a soft, comfortable and secure fit. Clear tube ferrules provide loop size adjustment and ensure a snug but comfortable grip around the archer’s finger and thumb. Bowrap Finger slings prevents the bow from jumping forward during the shot, and allows the "grip" hand to the relaxed, resulting in increased accuracy and higher scores. 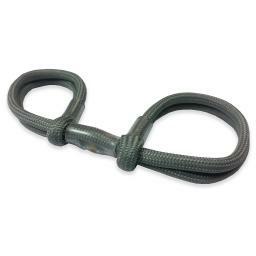 This double loop design is preferred by some archers for its comfort as its twice the width of our single loop finger slings. Over time finger slings can get a little dirty, our slings are machine washable should you want to clean them occasionally. 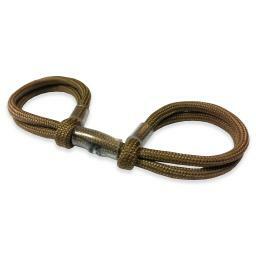 All Bowrap Finger Slings are hand made to order in house using quality Military Spec 4mm 7 Strand Core Parachute Cord commonly known as Paracord. This material has a minimum breaking strain of 550lb, more than sufficient to guarantee restraint of even the most powerful bow. Bowrap Double Finger Slings are offered in 27 fabulous colours, so whether you’re a compound or recurve target or field archer we stock a colour to suit every archers gear.